The report, ASEAN 4.0: What Does the Fourth Industrial Revolution Mean for Regional Economic Integration?, analyses how emerging technologies will reshape South-East Asia, and identifies actions for ASEAN leaders to prepare for the deep transformations that lie ahead. The report acknowledges the many existing national strategies for the Fourth Industrial Revolution, such as Thailand 4.0 or Singapore’s Smart Nation initiative. But it argues that ASEAN must think at the regional level, not the national level. Read more about ASEAN 4.0: What does the Fourth Industrial Revolution mean for regional economic integration? Transport has been recognised by the ASEAN Leaders as the very basis of the ASEAN economic development and integration as it plays a crucial role in the movement of goods, services, capital and people. It also provides great support in binding ASEAN’s economies closer together and in building the ASEAN Economic Community that is so vital for the future of ASEAN nations. The ASEAN Strategic Transport Plan / Brunei Action Plan (BAP), which was adopted by the Sixteenth ASEAN Transport Ministers (ATM) Meeting in November 2010, serves as the main reference guiding ASEAN transport cooperation and integration as well as identifies strategic actions to be implemented in the period 2011-2015. The BAP also supports the new priority of enhancing regional connectivity identified in the Master Plan on ASEAN Connectivity (MPAC). ASEAN was proclaimed a Community through a Declaration signed by ASEAN Leaders at their 27th Summit in Kuala Lumpur on 22 November 2015. This is a historic development and important milestone in the evolvement of ASEAN since its founding in 1967. An ASEAN Community is the realisation of the vision articulated eight years ago by ASEAN Leaders for the regional organisation to achieve community status by 2015. 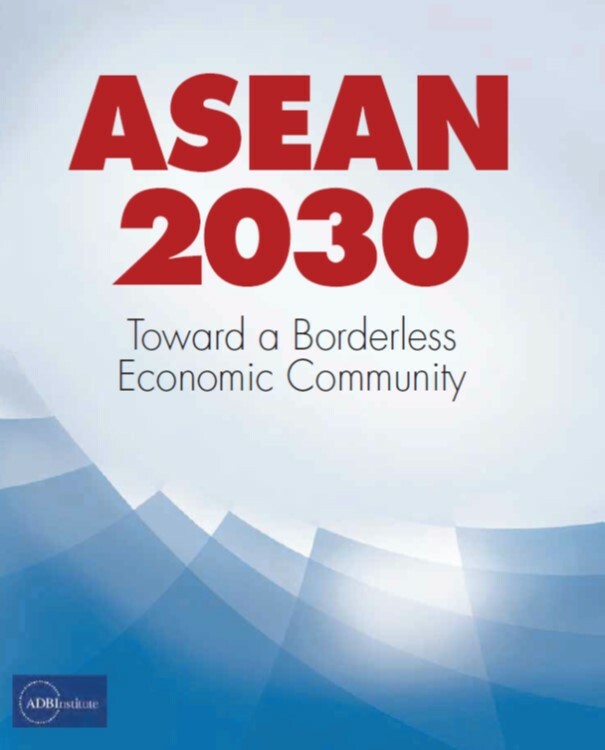 ASEAN 2025: Forging Ahead Together, which was simultaneously endorsed by the Leaders at their 27th Summit, charts the path for ASEAN Community building over the next ten years. It is a forward looking roadmap that articulates ASEAN goals and aspirations to realise further consolidation, integration and stronger cohesiveness as a Community. ASEAN is working towards a Community that is 'politically cohesive, economically integrated, and socially responsible'. 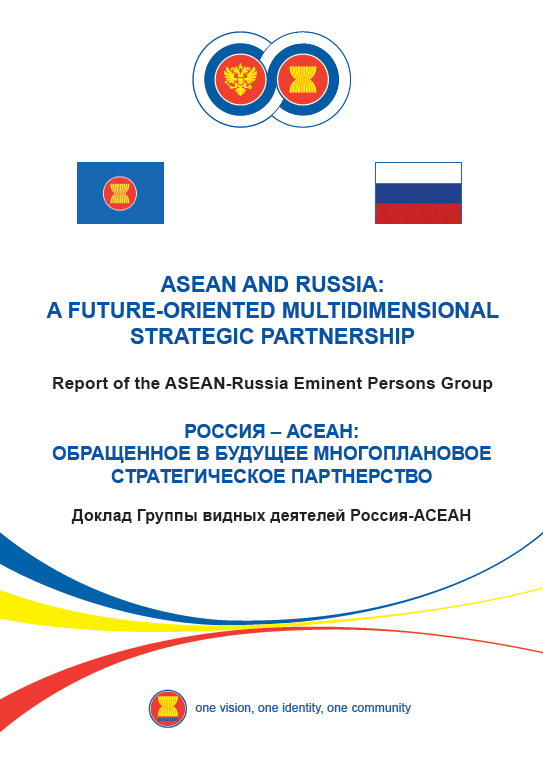 The ASEAN 2025 Document is the outcome of a year of planning and intense discussions, and reflects the determination of Member States to forge ahead with the next phase of ASEAN's evolvement. 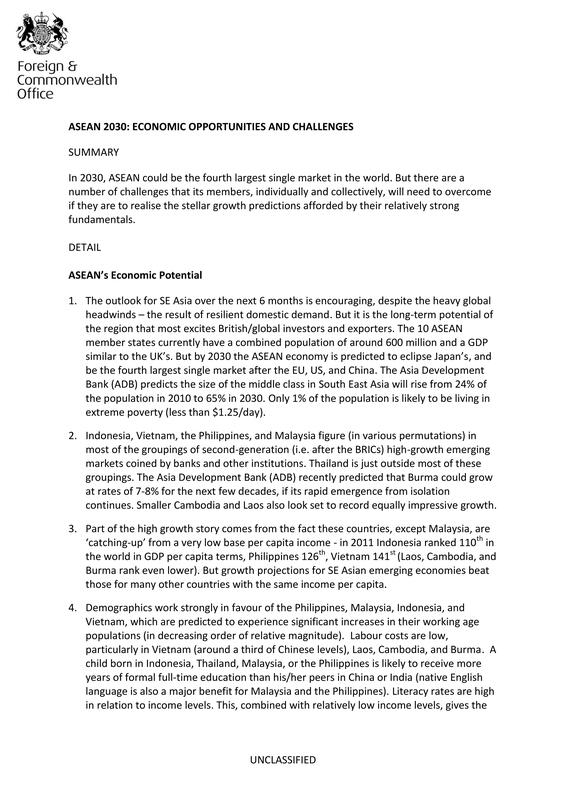 In 2030, ASEAN could be the fourth largest single market in the world. But there are a number of challenges that its members, individually and collectively, will need to overcome if they are to realise the stellar growth predictions afforded by their relatively strong fundamentals. 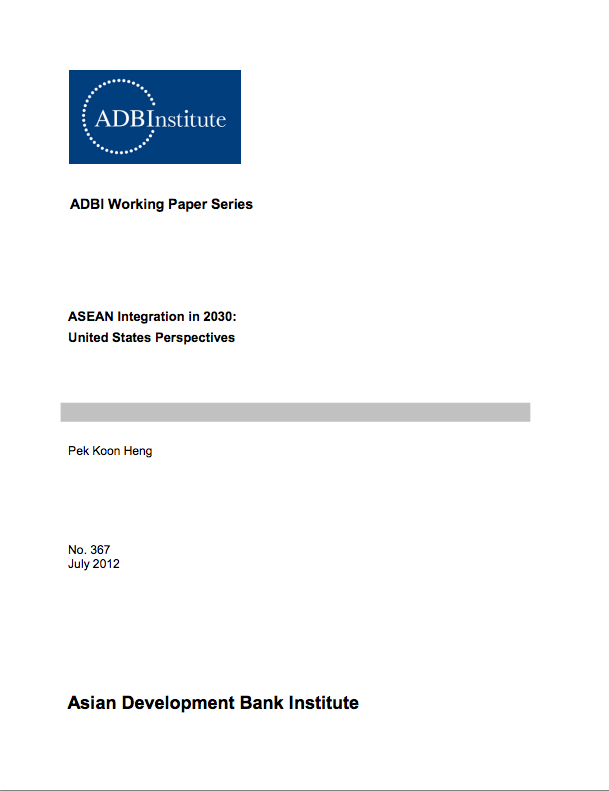 The paper argues that United States (US) participation in the East Asia Summit (EAS)—regional integration architecture led by the Association of Southeast Asian Nations (ASEAN)—was motivated by four changes in the regional economic landscape: (i) the Asian financial crisis of 1997 and emergence of the ASEAN+3 grouping; (ii) the rise of the People’s Republic of China (PRC) as the leading regional growth engine and an active player in regional integration arrangements; (iii) the failure of the Asia-Pacific Economic Cooperation (APEC) arrangement to foster trade liberalization in the region; and (iv) the inability of the World Trade Organization (WTO) Doha Development Round to lower global trade barriers significantly. In joining the EAS, the Obama Administration espoused an approach known as divided functionality, one that would give priority to APEC, and its trade-focused Trans-Pacific Partnership (TPP) agreement economic engagement with East Asia, and the EAS for addressing political and security issues. Currently, two architectures for regional economic integration are contesting. The first embodies the US vision of a deeply institutionalized Asia-Pacific economic community, as articulated by the ongoing TPP trade negotiations. The second is represented by the Asia-only ASEAN+3 framework, a shallowly institutionalized grouping with weak enforcement compliance mechanisms. However, despite differences in the two approaches, prospects for a healthy complementarity between them—through overlapping memberships, the application of open regionalism, and the benefits of competitive liberalization among specific trade agreements—seem promising.